My second stop of the day was at the Sacaton Rest Area at Mile Marker 183 on Interstate 10. I wasn’t tired, (Pepper and I were only about 75 miles from where we started our road trip) but I had discovered that Arizona Rest Stops are usually scenic and informational – and this one didn’t disappoint. A large bronze marker at the site informed me the rest area had been the site of the first Government Indian School for Pimas and Maricopas, as well as Pima villages that served as friendly resting places for travelers heading west during the Gold Rush. The site was also the birth place of Ira Hayes, a Pima Indian who was one of the flag-raising Marines at Iwo Jima. I remembered seeing the 1949 movie, “Sands of Iwo Jima,” in which Hayes actually portrayed himself. It was one of those unexpected memory recalls that left me wondering what other trivia was hidden in my brain that might never be brought into the light without a jolt to shake it loose. Continuing its tribute to heroes, the rest area also contained grave markers of two Arizona police officers, Mark Dryer and Johnny Garcia, who had died in the line of duty. 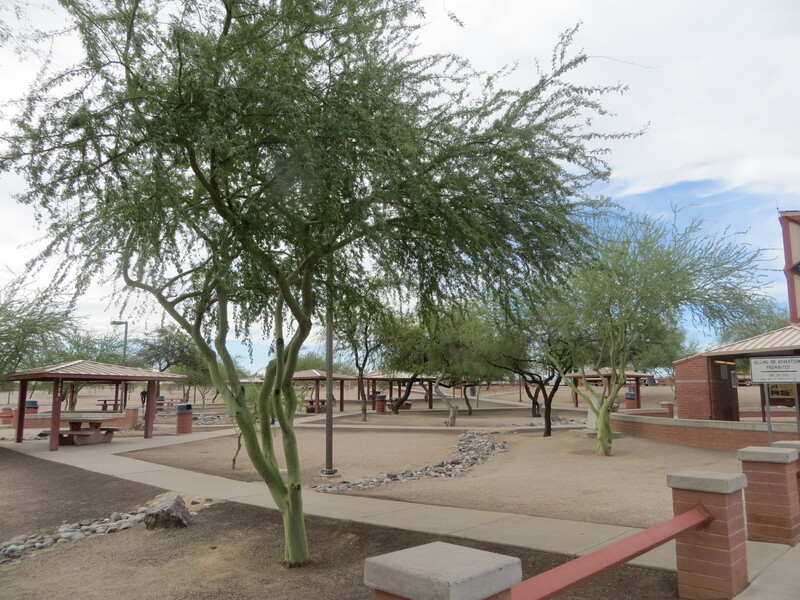 After reading all the honorary plaques and informational posters, and pondering their meanings, I finally let myself simply enjoy the landscaped picnic area and the Sacaton Mountains that formed the rest area’s backdrop. 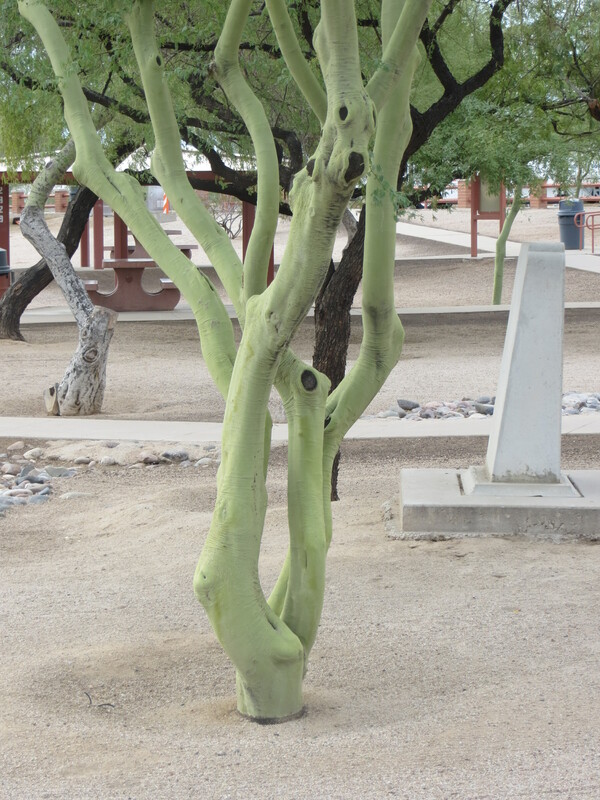 What I liked best were the Palo Verde trees with their green trunks and branches. The Palo Verde is Arizona’s State Tree. Numerous of these trees grow around my Tucson apartment, where they turn the landscape into yellow eye-candy when they blossom in early spring. Then, depending on the desert’s dicey water situation, they drop some or even all their leaves to conserve moisture. Their green bark can do everything that leaves do, making these trees one of the most drought-tolerant in nature. Appropriately, their name in Spanish simply means green stick. 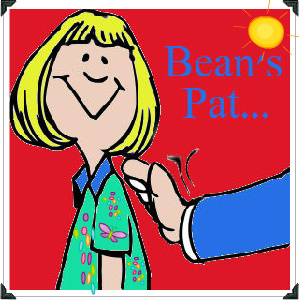 Bean Pat: Extraordinary http://tinyurl.com/pzc6svh Beautiful photographs, meaningful words. I delight in all your posts. It’s good to see you are on the road again. The rest stop photo looks so serene it made me hungry to head west. Thanks for sharing.